How to Clean a Green Pool & Keep Algae Out! Spring is here and soon you will have all your friends and family over for a weekend pool party. But, before taking the plunge you have to get your pool ready. One of the biggest issues you will face during spring cleaning is algae. Depending on how intense the algae is growing it can be painless or painful. The main reason algae grows in swimming pools is because the water has been stagnant and not properly treated with sanitizing chemicals. Algae is a huge reason to always keep your water moving through your filter and pool pumps during warm weather. Algae can also grow in dark places, with low circulation including under your ladder, on your steps, corner and creases. How do I clean my green pool water? 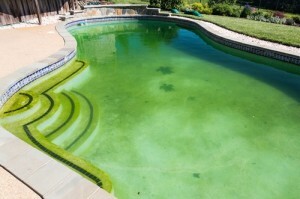 When you have light color green algae, the same color of pea soup the best way to get rid of it is to shock your pool with different levels of chlorine, depending on the severity of algae and gallons of water. 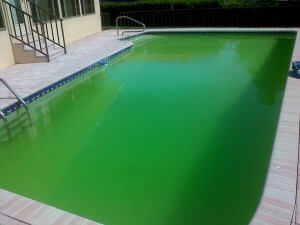 For a light green color algae, our recommendation would be to double shock your pool. With 1 pound of shock you can treat up to around 10,000 gallons of water. If you have a 20,000 gallon pool or less, we recommend adding 4 pounds of shock. Add 6 pounds of shock for 30,000 or less and so on. We also offer industrial strength algaecide. Its powerful cleanup action with or without chlorine makes it the product of choice for fast killing of all types of algae growths. Mustard algae is very persistent and can be difficult to kill. It’s important to be strict when treating your pool to ensure it doesn’t keep coming back. If you have a yellow or mustard color algae we recommend using Mustard and Black Magic Algaecide. For the best result, clean filter as necessary and balance pH levels between 7.4 and 7.8. Then brush areas affected with visible algae accumulations, specifically the walls, floor, steps, skimmer, under ladders. Next, apply 4 ounces per 10,000 gallons of pool water close to affected area; double the dose for stubborn algae outbreaks. Immediately apply to the pool 1 pound of ProTeam Power Magic per 10,000 gallons of pool water. Continuously circulate pool and filter until pool clears. It is also important to clean all pool toys and anything else that is used in the pool. We also recommend washing all swimsuits in the laundry. If you have Black algae, this unfortunately is the worst kind of algae. It can be difficult to kill and keep out of your pool. This algae will require the most amount of time and effort. Our recommendation is to use Black Algaetrine. This product is designed to fight tough black algae. It contains copper and exclusive agents to prevent the growth of even the most deeply-rooted black algae cells. It’s safe for all pool types and will not discolor the when used. We have a recommended guide depending on the severity of the black algae. Heavy Algae Growth: First vacuum, clean, and scrub walls. Apply 12 ounces of Black Algaetrine algaecide per 10,000 gallons of pool water. Vacuum to remove algae debris. Maintenance Dose: (Free of visible algae) Apply 6 ounces of Black Algaetrine algaecide per 10,000 gallons of pool water every 5 to 7 days. NOTE: If high temperatures prevail or pool has unusually heavy us; add maintenance dose more frequently. Advantage: Combination of algaecides specially formulated for black algae. Contains 3.07% active copper. 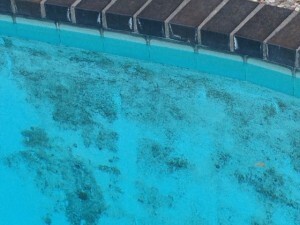 As the algae dies, no matter what form, it is important to keep the chlorine levels at a higher range for a week to fully eliminate any remains that are microscopic. For any remaining questions, don’t hesitate to contact a PoolZoom expert by phone 1-888-756-9666 or live chat.